Prev DIY Under-the-Sea Costumes: Sea Shell Next DIY Under-the-Sea Costumes: Fish! Blub blub! There’s some fun going on in deep water over here. 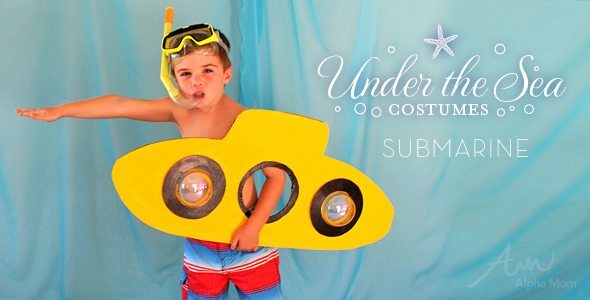 Here’s an easy way to make a kids’ submarine costume from cardboard, and will make everyone smile when they’re handing out trick or treat candy. This is the second costume in our series of Under-the-Sea kids’ costumes that we will be publishing for the next several days. 3. yellow and black acrylic paint**, or any color you want. First cut out your submarine shape. You can cut out three circles for window shapes (the center one for an arm hole) or just one hole for an arm hole and paint in the others. Your choice. An easy way to create circles is to trace around a bowl or jar. If you have a pop-apart Christmas ornament I say use it for special effects. You can also add a cardboard propeller wheel to the back if you like. I personally skipped that step but it would have been cool to attach with a brad so that it actually turns. Add a snorkel, some swim trunks and a swim shirt and maybe some flippers or rubber boots and you are ready to navigate the waters of Halloween! Perfect costume if you live in a particularly warm area of the country. Crafting time: 1/2 hour to an hour, depending on how fast your paint dries. **Always paint outside or in a well-ventilated area.